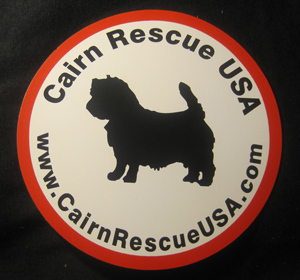 Cairn Rescue USA invites you to become a CRUSA member. As a member, you will receive a token gift bearing the CRUSA logo as a thank you for your support. Annual membership dues are $25 for the Toto Club, $75 for the No Place Like Home Club, $150 for the Emerald City Club, $250 for the Ruby Slippers Club and $500 for the Yellow Brick Road Club. The annual membership year begins on January 1 and ends December 31. Memberships purchased after October 15th are for the next calendar year. We also offer a lifetime membership for $1,000 which can be paid in a lump-sum or in 4 installments of $250 over a 12 month period. All memberships are 100% tax-deductible in the year in which they are paid. 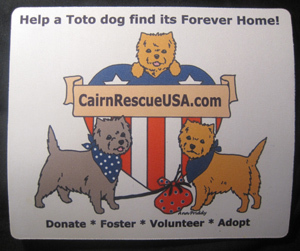 Membership is not a requirement to volunteer with CRUSA. To learn more about our memberships, please read Article I of our Bylaws. You must have Adobe Acrobat Reader to view the Bylaws. measures approximately 9 in x 7-1/2 in.